In large bowl, mix cookie mix, vegetable oil, water and egg with spoon until dough comes together. 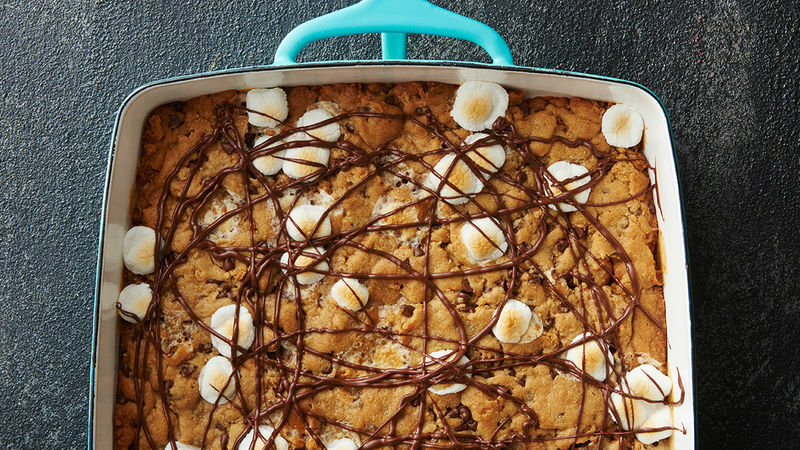 Stir in cracker crumbs, 1 cup of the chocolate chips and the marshmallows. Dough will be crumbly. Press into pan. Bake 16 to 20 minutes or until light golden brown. Cool 15 minutes. In small microwavable bowl, microwave remaining 1/4 cup chocolate chips uncovered on High 30 to 45 seconds; stir until smooth. Drizzle over top of bar. Cool at least 1 hour 30 minutes until chocolate is firm. Cut into 6 rows by 4 rows. Store covered at room temperature. For a more decorated look: Place melted chocolate chips in resealable food-storage plastic bag. Cut off small piece of corner; drizzle chocolate over bars.